NOTICE-1--- Important message to the stakeholders - උනන්දුව ඇති ඔබට වැදගත් පනිවුඩයක්. NOTICE-2--- Market research for the mission - සෞඛ්‍ය සේවාව සඳහා පාරිභෝගික සමීක්ෂණය. 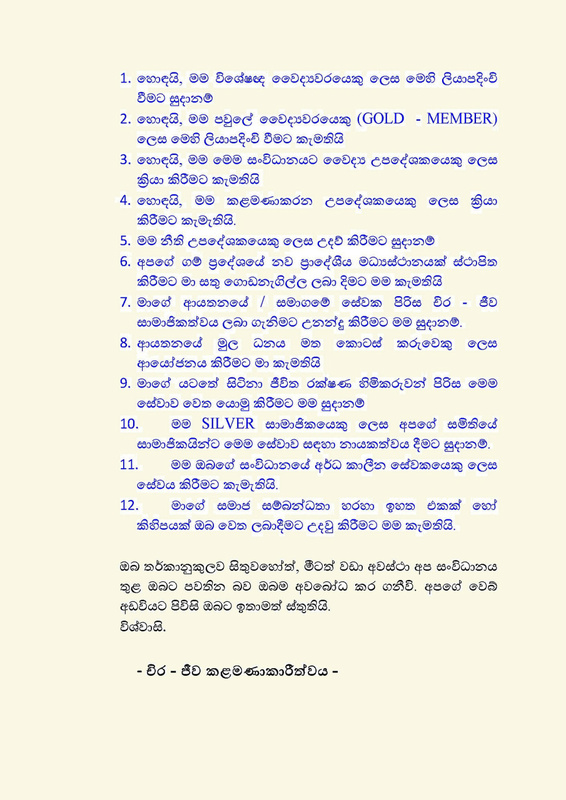 NOTICE-3--- A powerful message about team work and leadership -නායකත්වය සහ කණ්ඩායම් හැඟීම පිළිබඳව බලවත් පනිවුඩයක්. Notice to the invited and well informed readers. 1-Okay, I will register as a specialist doctor in this mission. 2-Okay, I will register as a GOLD MEMBER in this mission. 3-Okay, I will act as a medical consultant for your organization. 4-Okay, I will act as a management consultant for your organization. 5-Okay, I will give my support as a legal consultant for you. 6-Okay, I will give my building /place to start a new regional center of your organization in our village. 7-Okay, I will motivate employees of my company/organization to get your membership. 8-Okay, I will help you to develop the business by investing in your capital. 9-Okay, I can motivate my life insurance clients to get the CHIRA-JEEWA membership. 11-Okay, l can join your organization as a part time employee. 12-Okay, I will use my contacts and friend list to open one or few opportunities of above list for your organization. If you think strategically, there will be many more opportunities to buildup partnerships with us in addition to what is mentioned above. We are waiting for your positive response. Ever so many thanks for searching our web site. A research project to assess the demand, price sensitivity, service obtaining capacity, attitude and awareness in the market for this new online E – health service. Please follow the steps below. 1- Please click the link below. 2- Go through the questionnaire available in our google drive account. 3- Just click the answers (responses) in each box. 4- Submit it to us at the end. 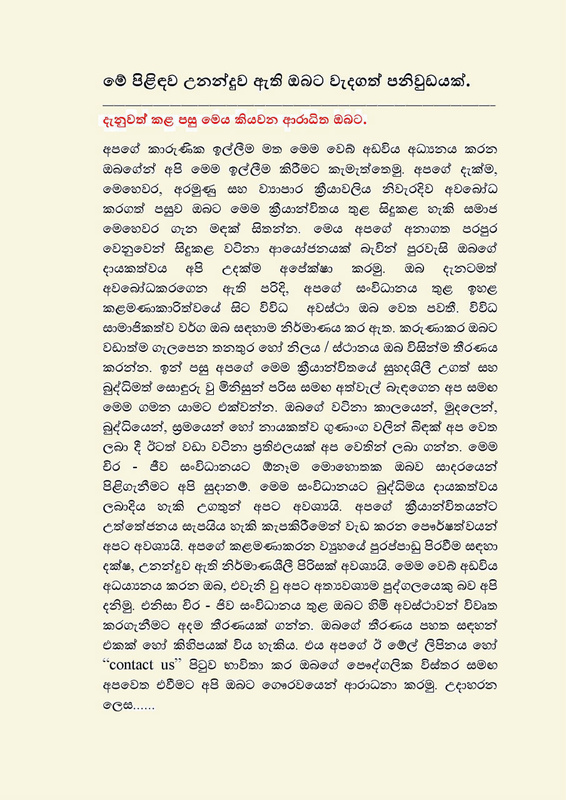 රෝග නිවාරණය, සෞඛ්‍ය ප්‍රවර්ධනය සහ සෞඛ්‍ය කළමණාකරනය වෙනුවෙන් ශ්‍රී ලාංකිකයින් වෙත නවීනතම මාර්ගස්ථ විද්‍යුත් මාධ්‍ය සෞඛ්‍ය සේවාවක් හදුන්වා දීමට අප සැලසුම් කර ඇත. මෙය අපගේ අනාගත පරපුරෙහි නිරෝගී සම්පත වෙනුවෙන් කරනු ලබන වටිනා ආයෝජනයකි. එවැනි සේවාවන් පිළිබඳව පාරිභෝගික ඉල්ලුම, අවබෝධය සහ සේවාවන් ලබා ගැනීමේ හැකියාව අධ්‍යයනය කිරීම සඳහා තොරතුරු ලබාගැනිමට මෙම ප්‍රශ්ණාවලිය ඉදිරිපත් කරනු ලැබේ. මෙම තොරතුරු කොළඹ ජාතික ව්‍යාපාර කළමණාකාරීත්ව ආයතනයේ අධ්‍යයන කාර්යයක් සඳහා ද පසුව අප ආයතනයේ ඉදිරි ව්‍යාපාර සැලසුම් වෙනුවෙන්ද පමණක් භාවිතා කරන බව සලකන්න. සෑම ප්‍රශ්ණයකටම පිළිතුරු සැපයීමටත් සත්‍ය සහ නිවැරදි තොරතුරු ලබාදීමටත් කාරුණික වන්න. ප්‍රකාශයට අදාල ඔබගේ අවංක සහ ස්වාධින ප්‍රතිචාරය අදාල කොටුවේ (v) ලකුණ යොදා සටහන් කරන්න. CHIRA –JEEWA MEDICAL SERVICE(CJMS); a new E – health service providing private organization has planned to sell a service package which mainly covers disease prevention, health promotion & health management fields, for which the demand, price sensitivity and eligible target populations (market niches) in the market for that service package is still unknown. To specifically identify the demand & attitude in different categories of selected people for each and every E- health service. To identify the overall demand & attitude in different categories of selected people for the whole service package. To comparatively identify the target populations (different categories of people) who shows high demand for these services. To identify the attitude in different categories of people about the “service obtaining mechanism” from CJMS. To specifically evaluate the price sensitivity among different categories of people for the E-health services planed by CJMS. To identify possible weaknesses & threats in the practical aspect of the mission. To identify possible opportunities in the current / future market for this business? To identify possible strengths within the organization which can be used for business development? To arrive at conclusions & solutions to create a strategic plan for marketing & sales promotion part of this service. To differentiate target populations who have the capacity and ability to get the chira-jeewa membership (CJMS services). To identify the awareness and attitude in different categories of selected people about the existing health care system of Sri Lanka. This new health care service organization has a broader vision & mission to expand their services island wide .Therefore this research project has a scope to select the methodology, study population, and data collection process which can ultimately be inferred to a larger group of people. The researcher expects to select wide categories of people as sample population who represent all stake holders. This new service package contains lot of totally new concepts for the health care industry of Sri Lanka. Therefore when assessing the awareness in sample study population researcher expect to deeply analyses it concerning each & every concept. The final product (service packages) contains smart phone compatible computer software applications to automatize services. Therefore this research will deeply assess the attitude of people over the user-friendly features of the final product. 1. Specialist doctors - 100 sample representing various specialties & areas. 2. Family doctors (general practitioners) - 100 sample representing various areas of country. 4. Para- medical professionals - 100 sample representing various categories of health professionals in various parts of country. 6. Un-employees – 100 sample representing different socio – economic classes. 7. Leaders /executives who can act as agents for this mission - 100 sample from rural level to urban level. 8. Patients having non-communicable diseases: (NCDS) - 100 sample. 9. University students (non-medical) - 100 sample. 10. Medical students - 100 sample. Total study population-Minimum target= 1100. But depending on the replying frequency of general public to the questionnaire this figure is expected to be exceeding 1100. Survey method is selected both for retrospective & other data collections. I.By questionnaires given individually to intended individuals. II.By questionnaires published in the official website of the organization or sent via e mails. This questionnaire is designed to achieve above mentioned 11 objectives of the research project. Chronic illnesses are burden on individuals and on society. Given the increasing incidence of chronic diseases across the world, the search for more effective strategies to prevent and manage them is essential. The use of the Chronic Care Model (CCM) has assisted healthcare teams to demonstrate effective, relevant solutions to this growing challenge. 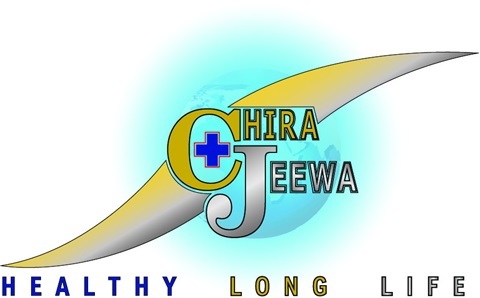 An e-health enhanced CCM (e-CCM) for this burden is going to be implemented as a multi-disciplinary business entity by Chira-Jeewa medical service (CJMS) pvt.ltd. This cross-sectional survey which used stratified random sampling technique and self-administered questionnaire method, was carried out to assess the demand, price sensitivity, attitudes and awareness in the market for this new e-CCM business plan. Data were analyzed using descriptive, correlational and inferential methods. 458 individuals (sample population) representing 11 sub categories of Sri Lankan community (study population) were studied under 7 socio-demographic variables to assess 40 additional qualitative variables related to the CJMS mission, ultimately achieving 11 specific objectives. Although it is proven that nearly 80% of adult population in developed countries are being using e-health platforms as self-health management support services, the dilemma was the feasibility of such services in Sri Lankan market. This dilemma has been rationally solved and answered through this research. The long list of its important findings proved its feasibility and future success of this e-CCM of CJMS. The best example was nearly 86% of respondents were about to purchase this service package if they were offered it through the correct path. Despite the anticipated idiosyncratic aspects and several obstacles which hinder its widespread adoption, ultimate findings strongly recommend CJMS to go ahead with their business plans. But it is advisable to seriously consider the given 15 recommendations and SWOT analysis findings during their software development, strategic planning and implementation / management process. 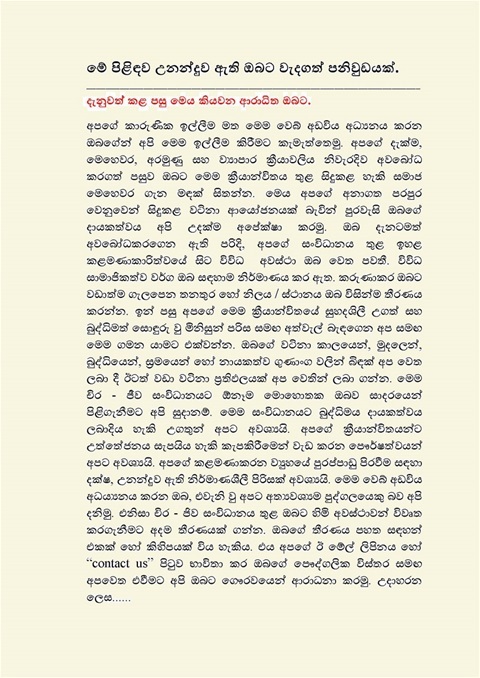 NOTICE-3--- A powerful message about team work and leadership - නායකත්වය සහ කණ්ඩායම් හැඟීම පිළිබඳව බලවත් පනිවුඩයක්. LETS WORK AS A TEAM TO MAKE A BRIGHT FUTURE FOR ALL OF US.THINK ABOUT OTHER'S NEEDS WHILE THINKING ABOUT YOUR NEEDS -....... අප සියළු දෙනාගේ අනාගතය ආලෝකමත් කරගැනීම සඳහා අපි එකම කාණ්ඩායමක් ලෙස ක්‍රීයාත්මක වෙමු . ඔබගේ අවශ්‍යතාවන් ගැන සේම අන් අයගේ අවශ්‍යතාවන් ගැනත් මඳක් සිතන්න.